Floradale Mennonite Church in Floradale, near Elmira, Ontario in July 1947. Source: Mennonite Community Photograph Collection, The Congregation (HM4-134 Box 1 photo 010.3.13). The Floradale Mennonite congregation began services in 1857, and formally organized in 1889. 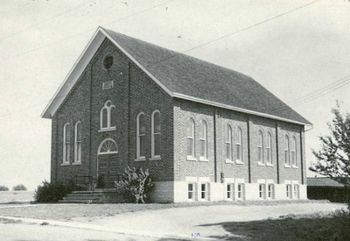 The first group purchased a building from the Evangelical Church in 1867. After the Old Order division a new building was constructed north of Floradale in 1896; in 1936 a new church was built at the present location. Abraham Dettwiler and William Hembling are considered founding leaders of the group. The congregation originated through division from North Woolwich Old Order Mennonite after a division in 1889. Initially (1856-1867) the church met every eight weeks in the home of Deacon William Hembling. The 1889 division of the North Woolwich Old Order from the Mennonite Conference of Ontario caused a split in the congregation, after which the church was officially organized as Floradale Mennonite. The Old Order retained use of the building and the conference group was without a church building until 1896. The congregation affiliated with the Mennonite Conference of Ontario from 1889-88, Mennonite Church Eastern Canada since 1988 and the Conference of Mennonites in Canada / Mennonite Church Canada since 1995. Floradale Mennonite is part of the Mennonite Church segment of the Mennonite "family." The language of worship is English; language transition from German occurred in 1920s. Floradale is the parent church to Elmira Mennonite (1924), Bethel Mennonite and Berea Mennonite (1947), and Glen Allan (1944). Bauman, Brent. Forged Anew : a History of Floradale Mennonite Church, Hembling-North Woolwich-Floradale 1856-1996. Floradale : The Church, 1996. Burkholder, L. J. A Brief History of the Mennonites in Ontario. Kitchener, ON: Mennonite Conference of Ontario, 1935: 77-79. Canadian Mennonite (4 January 1956): 3. Martin, Delton. "History of the Floradale Mennonite Church." (1967), 14 pp., Mennonite Archives of Ontario. Martin, Delton. History of the Floradale Mennonite Church, 1857-1971. Floradale: The Church, 1971, 28 p.
Mennonite Reporter (23 January 1989): 13. Martin, Edith. "The Growth of the Floradale Mennonite Church, Floradale, Ontario, 1944-64." (1965), Mennonite Archives of Ontario. Church records at Mennonite Archives of Ontario. Dettweiler, Reuben and Sam Steiner. "Floradale Mennonite Church (Floradale, Ontario, Canada)." Global Anabaptist Mennonite Encyclopedia Online. July 2000. Web. 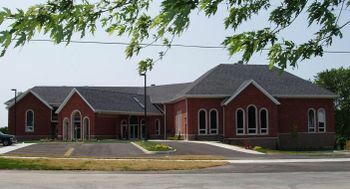 26 Apr 2019. http://gameo.org/index.php?title=Floradale_Mennonite_Church_(Floradale,_Ontario,_Canada)&oldid=156822. Dettweiler, Reuben and Sam Steiner. (July 2000). Floradale Mennonite Church (Floradale, Ontario, Canada). Global Anabaptist Mennonite Encyclopedia Online. Retrieved 26 April 2019, from http://gameo.org/index.php?title=Floradale_Mennonite_Church_(Floradale,_Ontario,_Canada)&oldid=156822. Adapted by permission of Herald Press, Harrisonburg, Virginia, from Mennonite Encyclopedia, Vol. 2, p. 341. All rights reserved. This page was last modified on 15 February 2018, at 11:34.